Your child, mistaken for a senator's daughter, is kidnapped by the cartels. So many great 80's action movies and video games have sprouted from similar plot lines. Rubicon's Narcoterror is at least three of them. As I began my visit to the Rubicon Organization's E3 2012 meeting space I was placed in a chair in front of what I swore was an HD update of the classic game Commando. An isometric twin stick shooter with graphics that aren't too shabby for a title heading to Xbox Live Arcade, the PlayStation Network and PC this fall, Narcoterror is, at first glance, a solid little game with responsive controls, a retro interface, and the same sort of simple, addictive gameplay that made us pump quarters into arcade machines when we were young. If they still made em like they made em back then, Narcoterror's core mode might be sitting in an arcade somewhere. It's got all the earmarks of a cabinet game. It's quick and responsive, the various weapons (machine guns, shotguns, grenades, etc.) 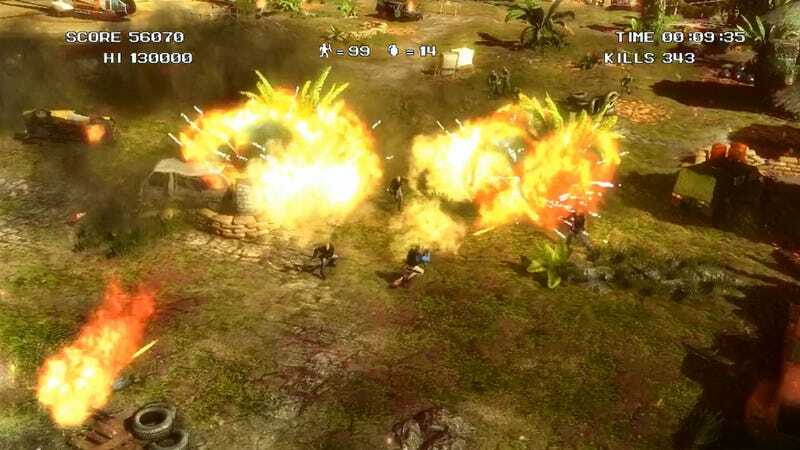 pack a satisfying punch, and later in the demo, when the scene switched from open planes to twisting jungle pathways, the camera followed the action smoothly, the mark of consummate isometric shooter professionals. As I shot my way through hordes of cartel thugs, special objectives would appear, requiring me to press a button to blow up an artillery nest or, in some cases, free prisoners of war from captivity. Those prisoners didn't follow me, however, and I soon found out why. Soon I stumbled upon a helicopter, and this happened. Suddenly I was playing Choplifter, tasked with avoiding heat-seeking missiles while rescuing the hostages I had freed and flying them to safety. The entire level I had just gone through as an isometric shooter / platformer (jumping is involved) was now a 2D side-scroller. And then I found a plane. And I was playing a top-scrolling shooter, akin to Capcom's classic 1942. So when I say that Narcoterror is a love letter to 80's action games, perhaps I mean more of a love child, combining the best of the old with the look and polish of the new. Narcoterror is due out in 2013 for console and PC digital download. The full game will include hours of drop-in, drop-out co-op story mode and an arena mode where players can just shot the living crap out of each other. What more does anyone need?